There’s a new crop growing in O‘okala and Pepe‘ekeo on the North Hilo/Hamakua coast—well, a new crop for the Big Island, anyway. Big Island Dairy, formerly Island Dairy, has planted field corn in O‘okala and Pepe‘eke‘o to help feed its cows. The corn will be fed as ensilage—“silage” as most farmers call it: green stalks that are cut, chopped and stored in a low-oxygen environment so that they ferment in a process similar to the making of sauerkraut. The silage is one solution to a problem that plagues all livestock farmers in Hawai‘i: the high cost of imported feed. Since the islands grow little grain, farmers are forced to rely on Matson and Young Brothers to bring in feed from outside, often at ruinous prices. The home-grown silage could be a major aid in the survival of one of the state’s only two remaining dairies. But the new crop has still become a matter of concern for some local residents and farmers, because of one fact: Big Island Dairy is growing genetically modified corn. Whitesides didn’t specify what varieties of corn were being grown, but given that weed control is the object, the corn is probably one or more of Monsanto’s “Roundup Ready” varieties. Monsanto has long touted both the GM corn and the herbicide Roundup, which is also makes, as safe. But in recent years, some studies have begun to challenge that assumption. And the company has drawn fire for its heavy-handed tactics in dealing with farmers—it’s sued farmers, for instance, for patent infringement when pollen from GM crops drifted into non-GM farmer’s fields. The company has also been accused of tampering with science and with the agencies that regulate it. GM crops have generated negative publicity in the islands, as well. 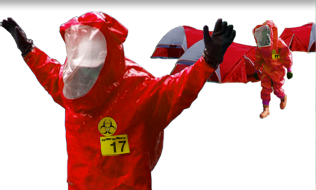 Pioneer Hi-Bred, for instance, is currently battling lawsuits filed by two groups of plaintiffs—one suit represents over 200 people—who claim that the company has not controlled spray drift and pesticide-contaminated dust from its GM test crop sites on Kauai. Some farmers and residents in Puna are still smarting from the state’s oft-bungled handling of GM papayas, originally developed by Cornell and UH-Manoa to fight papaya ringspot virus; small farmers claimed that the state’s “quarantine zones” set up to create a “sea of GM papayas,” isolating and protecting a few fields of non-GMO papaya for the Japanese market, discriminated against small farmers in favor of a few large export companies; organic farmers complained that their papayas have been contaminated that pollen drift from GM fields, and the GM papayas, though resistant to ringspot, have proved especially vulnerable to a fungal disease, forcing some farmers to periodically abandon their fields anyway. Native Hawaiians have taken offense at attempts to create GM versions of their beloved kalo, and Kona Coffee farmers have resisted attempts to introduce GM coffee. “If there’s still GMO grown here, blowing pollen in the wind, that is a concern for us,” she said, and announced that protestors would be demonstrating along the Belt Road beside one of the dairy’s O’okala fields on Friday, September 21. 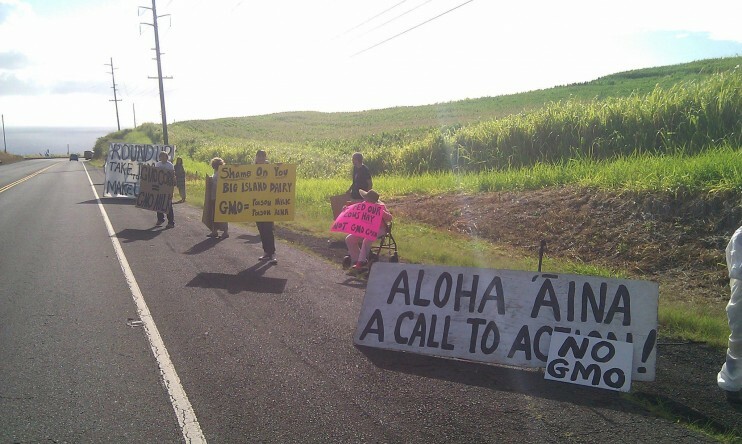 Yagong, in whose district the corn is growing, told Big Island Chronicle he shared some of the community’s concerns about GMOs with Whitesides. The problem is that not all of science is in agreement with Brubaker’s assessment—and that scientific papers critical of GMOs find an instant and persistent world-wide audience. The Web is awash with stories and blogs citing those articles, but often with no direct documentation or links, and often at Web sites that make no pretense of being unbiased—sites with names like treehugger.com and naturalnews.com. A site called responsibletechnology.org,, for instance, which proclaims itself “the most comprehensive source of GMO health risk information on the Web,” ran an article entitled “65 Health Risks from GMO food,” with factoids such as “More than 20 farmers in North America report that pigs fed GM corn varieties had low conception rates, false pregnancies or gave birth to bags of water.” But the story gives no links or sources for any of its allegations. Many of those factoids flying around the Web, however, are based on actual scientific articles that do seem to raise some basis for concern. In 2009, for instance, the International Journal of Biological Sciences published an article entitled “A Comparison of the Effects of Three GM Corn Varieties on Mammalian Health “ by Joël Spiroux de Vendômois, François Roullier, Dominique Cellier, Gilles-Eric Séralinis, four well-credentialed scientists from French universities. 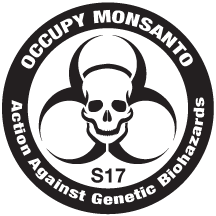 The study fed three varieties of Monsanto’s genetically modified corn, including one of the Roundup Ready varieties and two containing genes from a bacteria, bacillus thuringiensis (BT), that is used as a natural insecticide. The French scientists found that rats fed the corn suffered from various symptoms, including higher liver and kidney toxicity levels and enlarged spleens and hearts. “Our data strongly suggests that these GM maize varieties induce a state of hepatorenal toxicity,” concluded the article, which called for longer term studies of the three varieties. But Brubaker said that there were already studies out refuting the French study. “[With] almost any report of that sort, you can be assured there will be immediately responding research studies to validate or invalidate it,” he noted. Kremer is not alone. In a 2009 article in the European Journal of Agronomy, Don Huber, emeritus professor of plant pathology at Purdue University, and Purdue botanist G. S. Johal, warned that widespread glyphosate use could “significantly increase the severity of various plant diseases, impair plant defense to pathogens and diseases, and immobilize soil and plant nutrients rendering them unavailable for plant use.” Huber has also approached the USDA with concerns about a previously unknown microorganism that has appeared in GM-based animal feeds and appears to be linked to an epidemic of livestock infertility and miscarriages. An interviewer at the Web site nongmoreport.com asked Kremer if glyphosate was environmentally benign. Huber was among the many scientists, including agronomists, plant pathologists, veterinarians, nutritionists, pediatricians and medical doctors, featured in the documentary “Genetic Roulette,” which screened at the Honoka‘a rally before the musicians came on. Those researchers raised a host of apparent human and animal health problems, from infertility to cancer. The scientists also brought up problems in humans exposed to the GM crops/and or Roundup. Some of the scientists also talked about pressure exerted on them, up to and including firing, by Monsanto, public officials and their peers. One Oregon researcher, for instance, talked about releasing a study critical of GMOs, then getting a call from the former president of her university, questioning whether she “belonged” at the school. Caught in the crossfire of these scientific barrages and counter-barrages are companies like Big Island Dairy, who just want to give their corn a fighting chance against weeds such as elephant grass, which can quickly grow much higher than the corn. “The weeds that we have are entirely different for the middle of IA, and they grow much more aggressively,” notes Brubaker, who also points out that some of those weeds themselves contain toxins that can harm cattle. There are, in fact, non-GM varieties of corn bred specifically for Hawaii—Brubaker himself developed some of them—and it is possible to raise non-GM corn on the North Hilo/Hamakua Coast. Brubaker notes that Loeffler Farms, for instance, grows one of his conventional sweet corn varieties on that coast. But according to Brubaker, even the conventional corn may require chemical assistance from pesticides such as Atrazine, which have their own environmental consequences; they may get into groundwater if improperly applied, so they must be applied by a state-certified specialist—an additional cost for the farmer. How the GM corn could affect those existing sweet corn crops is another issue. Corn for silage is cut green, but after the corn has tasseled—which means that pollen from it could get to other plants. “That corn can cross with people’s sweet corn, and do people want those genes in their corn? Probably not,” local natural farming advocate Nancy Redfeather told BIC. She noted that bees carrying pollen could travel up to seven miles a day. But aside from the dairy, GM corn is already on Hawai‘i Island, in thousands of food products imported daily. If you drink non-organic milk, whether it’s from the mainland or it’s from local cows fed with imported feed, you’re probably drinking milk from cows that have eaten GMOs. The only possible change would be if Island Dairy managed to grow conventional corn. That’s the outcome Yagong hopes for. He notes that the number of dairies in the state has now shrunk from 24 to two, and he thinks it’s important to support the two that remain. “I think that would make a lot of people very, very happy and may even distinguish his product further if they knew that the milk was GMO free and fed from conventional corn,” he says.